Sadhana means ‘conscious spiritual practice’ and nowhere is this intention needed more than in the realm of birthing and new motherhood. Whether you join us for personal interest, for your own pregnancy journey or to be of support in a multi-faceted way for your clients we are so excited to be offering for the very first time in Australia an education which combines a fully certified and in-depth pre and post natal yoga teacher training with doula certification. 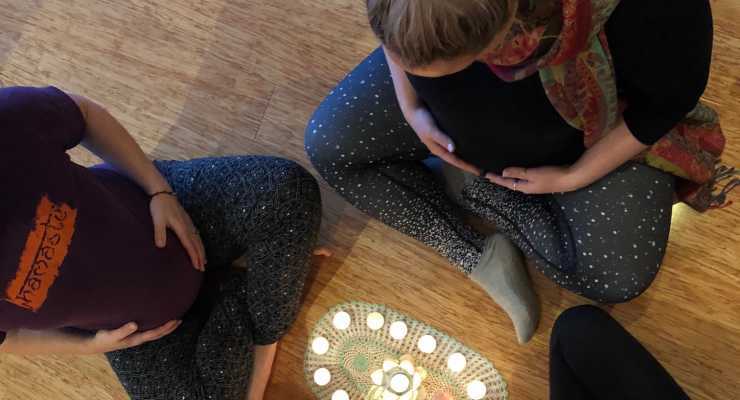 Upon completion of this training you will be able to offer so much as a care-giver to pregnant women and find a whole new way of practicing yoga, teaching yoga and developing your career as a birthing support person. THIS TRAINING IS ONLY OPEN TO YOGA TEACHERS WITH A MINIMUM 200 HOUR CERTIFICATION. Everyday Sadhana Yoga in collaboration with The Australian Doula College offers for the first time ever a training which meets the highest standard of pregnancy and post natal yoga teacher training with a full and certified doula training. When running our pregnancy trainings previously, many of the teachers would express an interest in doula training (especially once you came to understand the importance of the role of the doula and also after you’d spent some time with Renee Adair the incredible director of the Australian Doula College). This prompted us to explore how we could offer both doula and pre/post natal yoga teacher training in one package. Once we started to explore how a collaboration could work we came up with this incredible offering. It includes an in depth and thorough grounding in teaching yoga to pregnant women and to women in the journey following childbirth. It also gives you the opportunity to become a certified doula. The training will run over four weekends. There is an additional home-study component between these sessions, which includes journaling, reading, completion of Doula workbooks, watching some specific documentaries, class planning and yoga teaching practice. The training is 150 hours, including birth attendance or 100 hours without birth attendance. Continuing Professional Development (CPD) points are available with both Yoga Alliance and Yoga Australia for the yoga study portions of the training. In addition we are currently in application for accreditation with both these bodies for Post-Graduate Certification in Pregnancy and Post-Natal Yoga which we expect to receive in early 2018. The Australia Doula College also recognises and certifies the training. Upon completion you will receive a certificate and details of how to register with your chosen governing body. Note re: Yoga Australia in order to obtain the Post-Graduate Certification from Yoga Australia you need to have completed a 350 hour Level 1 teacher training, for the purposes of Yoga Alliance accreditation and joining this training however we only require completion of a 200 hour training. Katie Manitsas is the founder and director of Everyday Sadhana. She is an advanced level Jivamukti Yoga Teacher and a Wise Earth Ayurveda master teacher. She is also qualified in Kundalini Yoga and as a doula (childbirth support person) and holds the highest possible accreditations with both Yoga Alliance and Yoga Australia. She has been teaching yoga for over 20 years. Katie’s passion is in yogic philosophy and the seasonal practices of sadhana – bringing devotion and a sense of the sacred to everyday life, as well as compassion for animals and a deep reverence for nature. Katie is a published author of several books including ‘The Yoga of Birth’. She is the mother of four young boys and lives with her loud and busy family in Sydney’s Inner West. Renee Adair is the founder and principal educator of the Australian Doula College and the charity Doula Heart Network. She first began working with women and babies in 1994 as a massage and Aromatherapist and Reiki Practitioner in 1998 began studying and working as a Doula, Childbirth and Early Parenting Educator and Birth Counsellor. For three and half years she then worked for the Australian Red Cross at their young women’s health program/refuge and set up both the outreach and childbirth and early parenting education programs for that service. Renee has spoken on Radio National on the subject of Doula support and she presents at conferences, seminars and workshops on all things pregnancy, birth and early parenting. She is also a regular contributor in pregnancy and parenting publications and websites. In her career she has supported hundreds of women, their partners and families through pregnancy, birth and the early parenting phase. Renee has trained thousands of doulas since 2004, lives in the beautiful South Coast and still attends births on a regular basis. $3550 (icl gst).This training is amazing value!Payment plans are possible, please contact us to discuss. Payment is transferable but NOT refundable once your booking has been accepted.Additional costs:Purchase of the following books (not included in course fee):‘Birth’ by Catherine Price and Sandra Robinson‘Well Adjusted Babies’ by Dr Jennifer Barham-Floreani‘Doula Handbook’ by Marshall H. Klaus‘Yoga of Birth’ by Katie Manitsas‘Yoga for Pregnancy’ by Uma Dinsmore-TuliIn addition to these texts you will be provided with extensive course notes and workbooks.What does the training include?Comprehensive doula trainingAnatomy and physiology of pregnancyThe yoga component of the training is in three parts, PREGNANCY (conception, asana, prananyama, sadhana, yoga nidra, chanting and meditation), LABOUR PREPARATION (yogic scriptures on birth, pranayama for labour, birth without violence or ahimsa, pratyahara in birthing) and POST-NATAL (care of self, care of baby, sacred 40 days after birthing, mantras and chanting, shraddha, baby massage / yoga)Business skills for launching your doula business and pre and postnatal yoga classesTo become a qualified doula a current first aid certificate and working with children check is required (not included in course fee or teaching)In order to gain your full doula certificate you must complet three births. The training takes place over four intensive weekends. Please note, this training currently only takes place in Sydney, NSW.